Watching the video that has dominated the news lately of Oklahoma University fraternity students chanting a racist song has reminded me of my own history growing up against a backdrop of racism. Please bear with me as I walk down memory lane. When I was a very young child, probably around 4 years old, I remember seeing an orange glow on the horizon from my house in Liberty, MO. My mother explained to me that it was from fires that were burning in Kansas City, about 30 miles away. She said that the fires were burning because there were riots in the city. She was nervous, because the riots were not far from my father’s workplace. I was a fairly bright child, but I doubt I really understood what was going on. My family had been glued to the news on our small black and white TV for days, though, so I knew something big was going on. Later on, when I was in the third and fourth grade, I was “bused” to a different school. Franklin Elementary, apparently, was a primarily “black” school, and Manor Hill, my original school, was primarily white. The integration did not truthfully integrate white students with black students as the desegregation movement had intended, because they simply switched the 3rd and 4th grades of both schools. Most of my classmates were other white children from Manor Hill. I do remember interacting with black children on the playground, though, at recess. I noticed the differences between our skin color, hair styles, and cultural preferences, but it was not a big deal. Those differences didn’t seem to matter on the monkey bars or jungle gym. Kids were just kids to us, and we had fun no matter what. My parents were intelligent people, and they were up on current events. They taught me to be aware of the cultural context in which I was growing up. As a whole, they respected diversity, although their attitudes were still somewhat prejudicial. They did, however, impress upon me that respect for everyone was important. My family moved to Jonesboro, GA in 1976. Jonesboro was a small city outside of Atlanta that was deeply steeped in its Confederate history. Confederate flags were everywhere and related imagery was pervasive. When I began attending Jonesboro High School in 1978, a school that had a mix of black and white students, I was confronted with blatant racism for the first time. The most obvious example of racism was horrific. On “Senior Character Day”, senior students dressed up in costumes as if it were Halloween. A number of male students dressed up in white KKK robes and chased black students throughout the halls. The black students were terrified. It was not a joke to them. They honestly felt that their lives were threatened, and they quite possibly were in danger. Teachers and administrators did NOTHING to stop this. NOTHING. I was told that this was a tradition that happened every year on “Senior Character Day”. My family moved again to Hurricane, WV when I was a junior. I graduated high school there and went to college. I gained 3 degrees and embarked on a 20 year career in counseling that required me to embrace cultural sensitivity. I evolved in my understanding of diversity, and I tried to embrace sensitivity the best that I could. Years later, and living in Ohio, I still am not perfect in regards to diversity. I know that my upbringing that occurred against a backdrop of pervasive racism inevitably has left hidden essences of racism in my own psyche. I no longer sit by and accept it as “tradition” when I see blatant racism. I rail against it. But I know I still have a long ways to go, as do we all. When I first saw the video of OU fraternity students chanting blatantly racist words, it sickened me. The video took me back to “Senior Character Day” at Jonesboro High School. The students in the video had the same quality of smugness and white privilege that sanctioned racist bullying as not only acceptable, but as righteous. Both had an element of violence and fear based on race being “funny”. Both had the quality of “It’s OK because it is our tradition.” Part of me was amazed that this kind of thing was still happening in 2015, and part of me, sadly, was not surprised. At least it gets exposed and someone does something about it nowadays. It is no longer accepted as “tradition” as it was in my youth. It no longer conforms with mainstream ideas when exposed to the greater masses. There are still places where it does conform with the local mainstream, however, and that needs to change. What do I need to do to be a part of that change? We all want to believe that we are not racists, but simply proclaiming “I am not a racist” is not enough. Participating in racist action is not my tradition, but racism is deeply ingrained in my history. I cannot assume it has been completely eradicated from my being. What is my part in stopping racism? None of us are free, one of us are chained. Get over #TheDress and lets explore true visual mystery. I am not a fan of memes. They tend to annoy me at no end. When something goes viral on social media and other spaces of the internet, you cannot escape it. The fact that memes tend to appeal to the least desirable of human interests compounds the problem for me. When “The Dress” image meme started making the rounds, my first thought was, “Why is that ghastly dress getting any notice at all?” Regardless of what color it was, it had no appealing qualities to me, especially the way that the photo was cropped and posted. As I read one of the bazillion posts about “the dress” that appeared in my social media feeds, I knew instantly the science behind the visual controversy. I have been exploring the science behind color theory and visual appreciation of color all of my life. The meme wasn’t really about the science or color, however. The meme was, instead, an excuse for people to argue and insist that they were right, when there was no right or wrong in the first place. It was an excuse for everyone to pile on and participate in an unwinable fight. The content, although tapping into a deeper meaning, was really crappy content that was getting much more of its “15 minutes of fame” than it was due. Thankfully, the meme has evolved into a more valuable discussion of the science behind color and how we each see it a little bit differently. There are reasons why we see color in the way that we do and why each of us sees it differently. If you want to discuss the art and science of color, why not share a more appealing image? 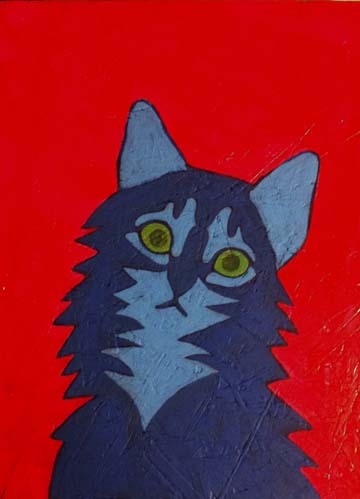 When I paint a portrait of a pet such as the one here of Edie, my thought processes are not simply focused on achieving a likeness of the pet. Instead, I am focused on using color as a way to bring that likeness alive in a vibrant and colorful feast of color. Edie is a brownish grayish tabby and white cat. Her natural colors are not ones that I prefer to use on my palette, so, rather than paint her actual colors, I chose to use colors that suggested them. When I paint white on an animal, it is never a pure white. it tends to be a shade of blue or a shade of pink that is developed through layering. Underlying layers contribute to the visual appreciation of the final layers of color, through reminiscent bits of color that are revealed around edges and through the interaction of pigments within the layers. 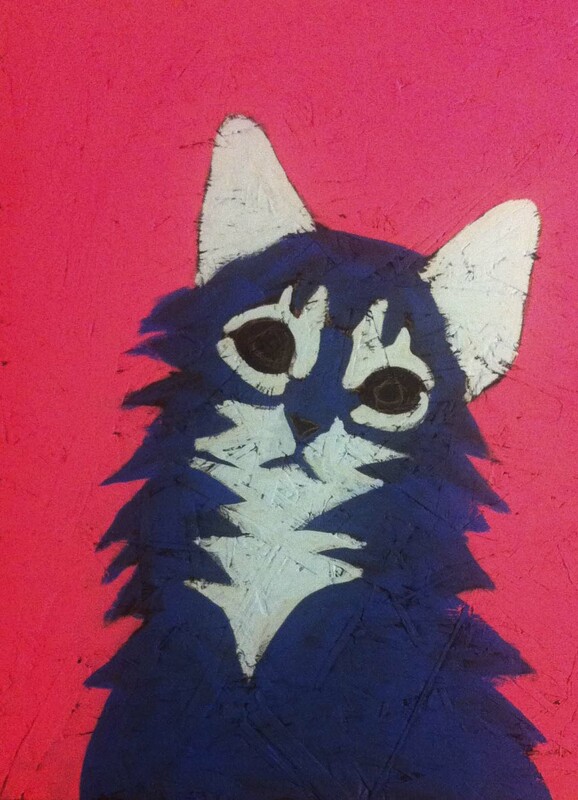 The use of an orange background and a blue blanket on which the cat rests also contribute to the way that we see the overall color effect of the image. Negative and positive space interaction make the composition dynamic, and light and dark contrasts also contribute to the way we see the overall image. I am not a scientist, and I confess that most of my exploration of color theory has been an intuitive journey based on what I know of the basics of the science. Still yet, I think that my portrait of Edie has more to offer in the debate about color than that ridiculous dress does. Why not give Edie her 15 minutes of sharing on the internet? Why does a painter who is all about color start every painting with black? My painting technique is nothing like Leonardo da Vinci’s, and I do not think his idea of painting a canvas with a wash of black had any influence on my development as a painter. Nonetheless, his symbolism of light and dark is very true in my own work. Bringing color and light out of darkness is both a technical and symbolic experience for me. With few, rare exceptions, my paintings always start with black. Not a “wash” as Da Vinci used, but a very deep and solid black surface. Why? I am not sure that I can articulate the answer. I can only say that it works for me. I don’t recall when I started doing this either. I think it started after I had done a series of drawings on black papers with Prismacolor pencils. Regardless of when it started, it is now the cornerstone of my painting process. After painting my canvas or board with black, I start blocking in shapes with certain colors. These colors are “underpainting” and serve to set up future layers of color that will be quite different. Although the photo here is not the best quality (sorry about that), you can see that I allow the black to show through in places, enhancing the textured crevices. This painting is on OSB board, one of my favorite surfaces because of its unusual texture. By the way, I almost always paint with acrylic paint which dries fairly quickly, so I can paint a number of layers in one sitting. When I paint my initial layers of color, I tend to paint the outside “negative space” first, using color to define the inner “positive space” shapes. By focusing on the outside shapes as well as the inner ones, I am always cognizant of making the overall composition one that is dynamic and visually balanced. I also leave a small black edge (from that initial black surface layer) between shapes to give an irregular outline. Once the shapes have been blocked in and the overall composition and shapes are feeling “right” to me, I start adding layers of color that illuminate and add detail and more texture. These colors are still setting up the eventual top colors that will look very different. Many artists mix their colors on a palette and blend them on the canvas to get different effects. I don’t do that. I never learned how to do that, quite honestly, as I did not take typical painting classes where they teach those techniques. Instead, I mix flat colors in plastic cups and put one color on a time. I “blend” colors with color theory by allowing the underneath colors to mix visually on the painted surface to give a certain color effect. By painting a transparent red on the pink layer, then a transparent yellow on top of the red (there are 3-4 layers of yellow), I get a different yellow and textures that I would not have achieved by mixing the colors on a palette. Around the edges of shapes, little bits of the underneath colors are exposed. Although they may not be evident without a closer view, they add to the way the eye sees the overall color and texture of the painting. The process may sound somewhat scientific and analytical. There is science involving optics and color theory involved, but most of that is beyond my understanding. Although I am always thinking about the way colors interact with each other on the painting surface, and I am skillfully responding to light and dark balances and other visual elements, the whole process is very serendipitous for me. I have come to expect different effects from years of experience, but each painting develops on it’s own and it never ends according to plan. 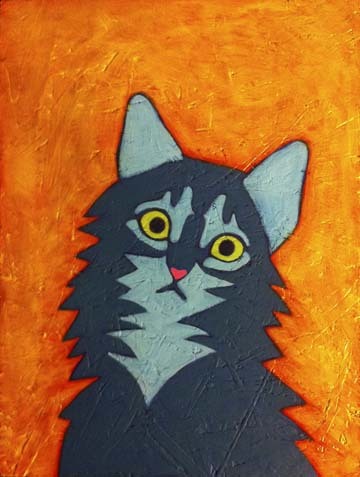 Also, painting animals brings an emotional element to the process. Although all the analytical thinking is going on in the background of my mind, I feel as though I am touching the soul of the animal with each brushstroke. I also am always thinking about how special the animal must be to it’s human companion. The painting is not only a piece of fine art to be valued on it’s artistic merits, but also a celebration of the relationship between the animal and it’s human caretaker. In this painting of Scout, I decided late in the process to paint a faux frame around image. I often paint faux frames on my Contemporary Folk Art Style portraits, but I usually include it in the composition in the early stages. This time I did not do that, but I realized later that I wanted it. That was the painting developing on it’s own. I have been venturing into teaching others to paint like I do (not sure if there is a name to my style). 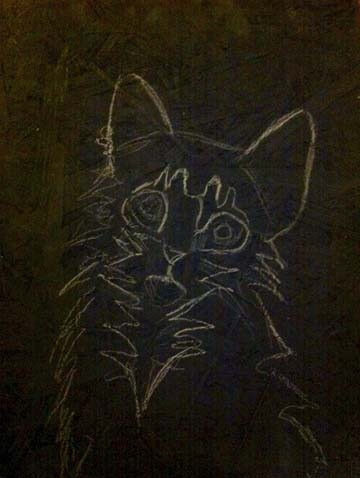 I have twice taught a pet portrait class to middle school students with amazing results. It takes some patience, but it is not as difficult as it may seem. 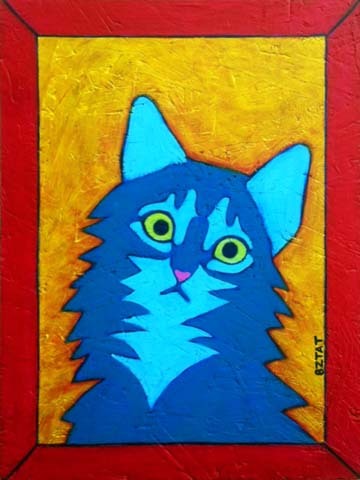 I will be holding an Art Mini-Retreat at my private art studio in Alliance, OH on October 18, 2014 where I will be teaching my Custom Folk Art Style Pet Portrait painting technique. I would love to have you join us if you are in the area! Early bird registration is only $60 (before September 15, 2015). You can learn more about the mini-retreat and register here. If you are not able to come to the retreat, I am looking into ways to hold online classes to teach my technique to students all around the globe. Stay tuned! let me know if online classes may be of interest to you in the comments below. You, too, could paint like BZTAT!